Mithra [sic] was born on December 25th. Or that very much the same is also true of Horus, Krishna and Prometheus? These claims, and others equally strange, were widely circulated on the early internet. They originated from a website, www.truthbeknown.com, run by a woman calling herself “Acharya S”. These claims were met with much derision at the time, at least among those with any knowledge of antiquity. But they were terribly useful to a certain sort of ignorant atheist, and so were repeated endlessly. Indeed they may still be met with online, in one form or another. The author never withdrew them, or admitted any mistake of fact. I was led to interest myself in Mithras as a direct result of the circulation of these claims. Occasionally I crossed swords with the authoress or one of her close disciples on various online discussion forums, an encounter that seldom left a pleasant impression behind. But always the claims were stimulating, and I received a great deal of enjoyment in chasing down the real facts of the matter on more than one occasion, and learning of strange or unusual ancient sources, such as Antiochus of Athens. We all need intellectual stimulus, and sometimes it may be found in strange places. On Christmas Day 2015, she died. She was 55 years old, and died of cancer, leaving a 13-year old son. That she should die on 25 December was itself full of irony. Acharya S was certain, certain with a degree of certainty that would appall most of us, that Christmas Day was a fraud: that Jesus of Nazareth never lived, and that the day was in fact the birthday of a huge number of pagan deities – Attis, Mithras, Adonis, Osiris, Horus, and so on. So she wrote, and so she preached with a fierce fervour that contradiction only strengthened. I cannot tell you her real name. She went by the pen-name of Acharya S; before that, of Acharya Sanning. In recent years she used the name “D. M. Murdock” on her books, but whether that was her legal name is not clear. If it was, her name may have been Dorothy. Nor can I tell you anything much of her background. She claimed to have modelled when young, in New York City; to have become a Christian briefly at that time. But she gave no account of her life. This cannot, therefore, be an obituary – only an account of what I encountered or found online. Her key assertion was that Jesus of Nazareth never lived, and that Christianity was merely an antique and fraudulent concoction from pagan beliefs. This she derived from 19th century atheist popular writers, and embedded into a hazy new-age system of her own that she called “Astrotheology”. But this system was really nothing: her life-energy was really spent in trying to rewrite history to prove Christianity false, and to convince as many as possible of her preferred account of events. Without the internet, it is unlikely that Acharya S would have ever been heard of. But the “Jesus myth” was taken up eagerly by atheists on the web. Claiming that Jesus never existed, and demanding people prove them wrong, is an easy way to render discussion futile, while creating an impression of doubt; for it requires no education, merely impudence, a willingness to demand others prove to them what everyone knows, and a determination that any evidence to the contrary shall be “inadequate”. Carried along by this tide, in 1999 she published The Christ Conspiracy: the greatest story ever sold. How well this sold I do not know, but it certainly attracted attention, and material from it has continued to circulate. She contributed to a film, Zeitgeist, which made many of the same claims. But mythicism did not pay well. She wrote online that she was very poor. It is a fact that, in the last year of her life, she was obliged to seek money from the public in order to pay medical bills. Pitifully, her executors have been obliged to continue the appeal in order to pay her funeral expenses. Acharya S stirred up interest in a whole load of obscure aspects of antiquity. It gave us all something to research, something to investigate, and much time and fun online in rebutting it. To this extent we are all poorer for her passing. On the other hand she did some real harm. Nobody is well served by getting the raw facts wrong. Many a gullible young atheist will have been confirmed in his newly-minted obscurantism by her work, and led just a step or two further from the light of knowledge into the darkness of ignorance and intellectual self-destruction. “Jesus mythicism” is the judgement of God upon modern atheists – that those who boast most frequently of their own logic, science, reason and learning should be led to advocate an ignorant, stupid claim in the face of the world. In this judgement she took a full part. To dedicate yourself full-time to proving that others are completely wrong is perilous to every human soul that does so, whatever the object so hated. It leads those who do it into a darkness of hate and blindness. This path she walked. She dedicated herself to trying to destroy the Christian religion, to the extent that she was able. I never knew the reason for this, but it must be personal. She was not an educated woman. This fact lay at the root of all the mistakes of historical judgement that filled her books. I never detected the slightest interest in history for its own sake. If she had had this, it might have given her the education she lacked. As far as I can tell, she never understood that history must start by compiling the primary sources and seeing what they say. To the end, a book by some writer of the 19th or 20th century was “authority” – so long as he said what she wanted to hear! In fairness she used better sources in her later books. Acharya S wanted, wanted very badly, to be learned; but only, one sensed, to bolster the cause. This lack of education meant that she had no critical detachment from her own claims. What she wanted to believe was what she believed, and woe betide you if you contradicted her wishes. Like many ignorant people, she seemed unaware that men may honestly disagree sometimes. Even her admirers describe her as “strong-willed”. I remember asking for evidence that Mithras had twelve disciples, and, after much abuse, being shown a relief with a Zodiac on it, and told that if the apostles were sometimes depicted as the zodiac in the renaissance, then clearly this showed that Mithras had twelve disciples. If you disagreed with her, on whatever basis, she asserted that you were simply dishonest. I usually felt sorry for her, except when provoked by some very gross piece of intellectual dishonesty. Perhaps I am unduly imaginative or sentimental, but I always felt pity for this poor woman. She was somebody’s little girl, somebody’s “mum”. Indeed any sensitive man must look at how women are treated in our times with hearthbreak and shame. Everything is against them. Everything encourages women when young to throw themselves away outside of marriage. The pain, guilt and misery that results must ruin many lives. In attempting to cope with the guilt, some turn into railers at Christians – the only people to say “this is wrong” – and, in their howls, one can sometimes hear the pain of a violated conscience. Acharya often railed against men, and “patriarchy”. Was there some awful experience at the hands of some selfish man or selfish men in her past? I do not know. But it is impossible to look at her life, and not feel a sense of waste. The world owes a great debt to energetic, single-minded women such as Florence Nightingale, or Elizabeth Fry, or several modern women. Such women are often personally charming, as Acharya was, and often attract dedicated supporters who feel chivalrous towards them, as she did. They are often determined to an intimidating degree, as Acharya seems to have been. Such women can achieve much. What can be vices in conversation can become virtues for society as a whole. Acharya S might have been one such. Who can say? May the God whom she was so fierce against in life have mercy upon her, and rescue her, somehow, from the consequences of her wrong choices in life. RIP “Acharya S”, 25th December 2015. Edit: Add a couple of words of clarification at one or two points. UPDATE (25 June 2016): Her legal name was Dorothy Milne Murdock, known as Dori, and she was born on March 27, 1960. I have found an obituary at the “The Hartford Courant”, published January 24, 2016, which mentions her family, which I have pasted into the comments. UPDATE (14 November 2016): Via her Facebook page (pointed to by this link) I find this image of her gravestone. « When will the librarians start to throw offline literature away? Hello Roger, just found this thread today. 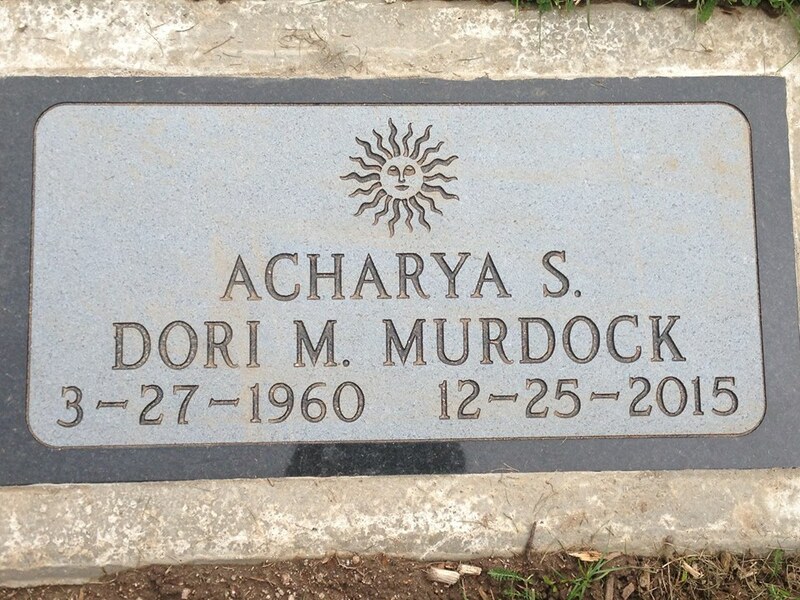 I am a 75-yr old confirmed Atheist, but didn’t know of Dori’s existence until about a month ago; 3 years after she died. I stumbled onto your Site, looking for more info. But you totally blew it when you said Acharya S. was Not educated! Totally. But I appreciate the info you Posted. It will help her memory and postulations survive. God speed. oops, ah, … good luck.